This easy sweet potato casserole comes from South America, where the sweet potato likely originated (or it could possibly have originated in Central America). It’s adapted from a recipe in The Art of South American Cooking. It's laced with fresh ginger and spices, and layered over a lining of sliced almonds. It's one of my favorite sweet potatoes recipes. At Thanksgiving, some of my friends who don't eat grains or processed sugar enjoy this for dessert, as if it were a pie. Bake the sweet potatoes for 45-60 minutes at 400º, then cool until you can handle them. Peel and mash them in a bowl. Grease a large rectangular baking dish with 1 tbsp oil or butter, and sprinkle liberally with sliced almonds, reserving some almonds for the top. Mix the grated ginger with the allspice and cinnamon. Beat the eggs with some of the mashed sweet potatoes. Stir in the rest of the sweet potatoes, the remaining oil or butter, and the ginger/spice mixture. Spread in the prepared pan and sprinkle remaining sliced almonds over the top. Bake for 30-35 minutes at 375º, until it starts to brown around the edges. (Could take longer...the smaller and deeper the pan the longer it will take.) Watch the almonds carefully...if they are browning too quickly, set the casserole lower in the oven, or cover loosely with foil for 10 minutes or so. You could make this with orange winter squash. I recommend Buttercup, or Kabocha. The Microplane grater is the best tool to use if you want your casserole to have a really smooth texture. It's super sharp and is great for lemon zest too. If you don't mind little bits of chewy ginger, hardly noticeable, a regular grater works fine. 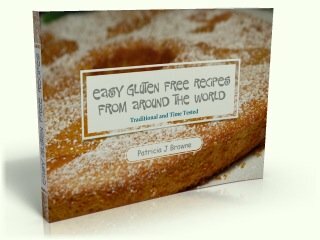 Get an eBook full of easy gluten free recipes by signing up for my FREE monthly ezine.